Lakeview Orchestra will perform Dvořák’s Violin Concerto in A minor on Tuesday, February 5th at 7:30PM at the Athenaeum Theatre. In January of 1879, eminent music publisher Fritz Simrock (1837 – 1901) wrote the following short note to his most venerated and profitable clients: “Would you like to write a violin concerto for me? Highly original, tuneful and for good violinists? Let me know what you think!” When Antonín Dvořák received this suggestion, he jumped at the opportunity. Having studied viola (the slightly larger, deeper, and more difficult-to-master cousin of the violin), he felt he was both familiar and comfortable enough with the instrument to compose a mature concerto for violin. Dvořák intended to submit the work for publication by the end of the year, but as is so often the case in artistic endeavors – especially with respect to collaborations – the finale version, as we know it today, would take more than four years to complete. Indeed, the musical journey for this work was prolonged and drawn out for not only personal reasons, but also due to an artistic conflict of vision between the composer and the violinist to whom the work is dedicated. 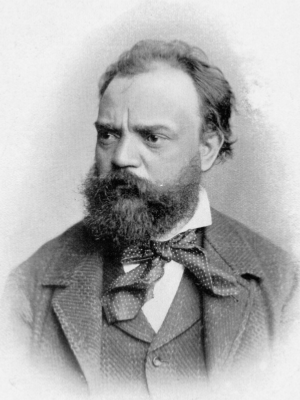 In an attempt to assuage misgivings over the collaboration, Joachim wrote to Dvořák, “While working on this revision I was struck by the many beauties of your work, which it will be a pleasure for me to perform.” As it happened, Joachim would not premiere the concerto; in fact, he would never perform the work in public even though the work was dedicated to him. This fact is all the more remarkable in that, until the final days of the concerto’s creation, Joachim devoted much energy to its preparation. It is possible Joachim chose not to perform the concerto because, as a musician of extremely conservative tastes, he simply could not endorse Dvořák’s unusual structural choices. Whatever the case may be, the Violin Concerto in A minor – Dvořák’s only violin concerto – was premiered by Frantisek Ondricek in Prague on October 14, 1883. Eight years later, on October 30, 1891, the concerto had its American premiere just a few miles from here, at 50 East Congress Parkway, with soloist Max Bendix and the Chicago Orchestra, led by Theodore Thomas. Though the work has the usual three movements, the concerto was a fairly radical formal experiment – and this may have been part of what troubled the highly conservative Joachim. The opening movement (Allegro ma non troppo) is serious and dramatic, painting a complex world of rich and thick musical color and harmony. It disposes of the traditional orchestral introduction to offer brief fanfare that is answered by a rhapsodic phrase from the solo violin. The body of the movement loosely encompasses a sonata-form scheme. However, after an extended exposition and development, a truncated orchestral recapitulation leads directly (attacca, meaning without pause) into the second movement, Adagio ma non troppo. This movement has a three-part form, whose melodious, searching subject reappears in ever-changing hues. It begins with a calm and lyrical solo melody that transitions to a middle section of turbulence, allowing for some of the showiest passages in the solo part. The middle movement concludes with the horn playing a reprise of the opening theme while the violin weaves a countermelody above it. In contrast to the singing nature of the first two movements of the concerto, the sparkling and vivacious finale (Allegro moderato) is based on a three-part theme that takes its inspiration from the syncopated dance rhythms of Bohemian folk songs. Dvořák’s Slavic impression touches every detail of the movement. Structurally a rondo, the movement’s opening theme and rhythm are that of the furiant, a rapid and fiery Bohemian dance with alternating time and frequently shifting accents. This gives way to an unexpected, melancholic, and contemplative middle episode based on the Czech dumka, a dreamy epic ballad that is wistful in nature. Ending the concerto in such a way would leave us wanting, so Dvořák, in his wit and banter, kicks back to the opening furiant melody for a blazing conclusion filled with good humor and playfulness.